The sales slump in Toronto real estate is persisting into the fall, but average annual prices across the region are holding up thanks to double-digit price gains in the condo sector. While the industry hoped for, and failed to see, a surge of back-to-school homebuyers, the further tightening of mortgage rules could add some temporary autumn heat. Still, with the month drawing to a close, it appears October sales volumes are 29 per cent below year-ago levels as fallout from the provincial government's attempt to cool the market drags into the fall, Realosophy.com President John Pasalis told BNN in an email. Although the overall market is “more balanced” than it was a year ago, Pasalis is seeing stark divergences in the market between condos and freeholds, and from neighbourhood to neighbourhood. “Average prices are up two per cent over last year, but this is due to the condo market which saw prices rise 17 per cent,” Pasalis told BNN in an email. And if you start investigating those Greater Toronto Area average prices by postal codes, the divergences are even more pronounced. Sales volumes in some of those communities north of the City of Toronto have been cut nearly in half, and average annual prices are down double digits. 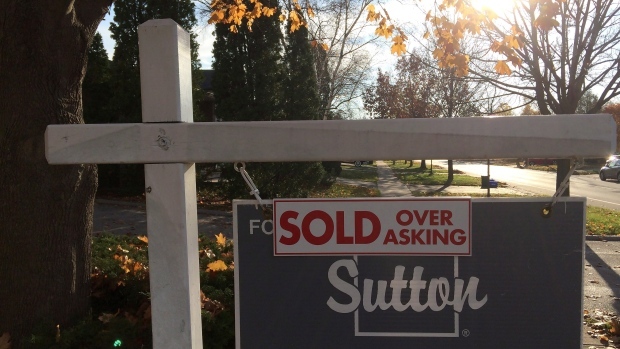 Prices in Whitchurch-Stouffville, Pasalis notes, are down 25 per cent year-over-year. One source of possible demand as the market moves into the final two months of 2017 is the further tightening of mortgage rules by the Office of the Superintendent of Financial Institutions, the country's banking regulator. Stringent stress tests meant to ensure borrowers can afford their homes at a higher interest rate are being extended to buyers with a down payment of 20 per cent or more. RateHub.ca suggests it could result in a family’s purchasing power being reduced by up to 21 per cent, once the new test is in place. “The recent changes announced by OSFI might actually result in a short-term rush as those that are impacted by these changes rush to buy,” said Pasalis.